Themes: starting school, friendships, school, diversity, families, teachers, classrooms, schools, playgrounds, new experiences. As a primary school teacher, of course I don’t have favourite students. But as a primary school teacher librarian…I absolutely have some favourite books, and ‘Starting School’ is one of them. I remember the first time I read this *perfect* picture book and just wanting to be able to share it with every family who had a little one about to start school, and every primary school teacher I knew. 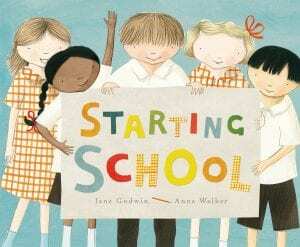 If you have a Story Box Library subscription through your school, kindy or public library, or you have a personal subscription, you can watch ‘Starting School’ being read here and they have a number of other great stories by Jane Godwin and Anna Walker also available. This gentle story takes little people through a day at school and invites them to walk through the school environment from the safety of the lap of a loved adult. 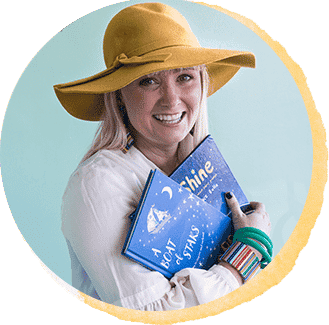 There is an enormous amount to explore in this book on multiple re-readings and it is the perfect conversation starter for you to talk with your own child or your students about all manner of worries, hopes and ideas about what school is going to be for them. Mel Kroeger has some great ideas below. These notes are designed to be used in the home environment to extend a shared book reading experience with discussion and some ideas for follow up activities. They can also be used in educational environments where in depth study of text is undertaken. Notes: This book could be read to any Primary School age group. For younger children it is obviously particularly relatable, especially if they have just started school. For upper primary children it could help refresh their minds to when they first started at school to help to relate to their ‘buddies’. Buddies are a system usually set up in schools where the older year level students are given younger student to spend time with. 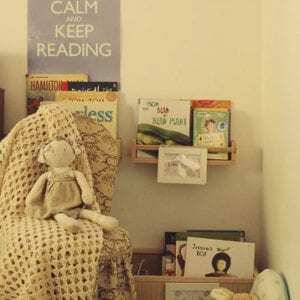 They may read books to them, help them with their work, draw pictures, play games with them etc. This helps both students. The older students become a role model and set an example to the younger students. The younger students have a familiar face in the playground they can seek out and someone they can ask for help from. Starting a new school year is always a nervous and anxious time for most children whether they are just beginning school or just a new year level or changing schools. This could be a book read together with both buddy classes, and the older students can assist the younger students with suggested activities below. Could it also mean starting at a new school or a new school year? Yes! How did you feel when you first started school/ at a new school /or a new school year? What kinds of feelings did you have? If you had one word to describe your first day of school, what would it be? How many children are on the front cover? 5! Do they all look the same? No. So if they are all different people do you think they all feel different things? Who are Tim, Hannah, Sunita, Joe and Polly? The 5 children illustrated on the front and back covers. The main characters? Who was a new friend you made when you started school? Do you remember learning something new? What was it? Did you discover something new or different? What was it? What do the front end papers show? Things that the children like/ have on their desk/ in their bag? What would you have drawn for you? What do the back end papers show? Self-portraits/ friends drawing others in the class? How many students are in the class? Can you count them all? How many are in your class? Is your class bigger or smaller? Look at the illustrations when reading as most pages contain photographs of real objects in them or collage has been used. Can you spot them? Discuss at the end what everyone likes about school in your class. Find out a little more about the author, Jane Godwin here (it also includes some fun facts about her!). Find out a little more about the illustrator, Anna Walker here. Anna Walker’s illustrations are inspired by pencil, ink and collage. Have students recreate their own self portrait similar to the ones on the back end papers. Draw an example on the board or large piece of paper. Have the children use mirrors as they draw themselves. You may like to create the self portraits just as Walker has done with the students using one colour only. You may like to be on lined paper too! Discuss what student’s favourite thing to do at school is or what their favourite thing about school is. Use the pages titled ‘Getting Ready’, ‘Making Friends’ ‘Snack Time’, ‘Doing Work’ and ‘Best Things About School’ as examples. Look at the illustrations carefully – most illustrations are drawn with pencil outline, then they are mainly coloured using collage or ink/watercolours. There are also collage highlights throughout. You could use magazines or catalogues (back to school catalogues are fabulous!) to cut out real life objects, or other shiny pictures to use for texture such as a dress or carpet. Plus most of those illustrations are placed on top of a coloured square – discuss layering of these. Have students recreate themselves doing their favourite thing at school. Hang your masterpieces with writing underneath to explain what they are doing. They will look amazing! In the book, Miss Quick takes the children on a walk around the school to find different places. Let’s look at maps and how they help us to get around. Obtain a copy of a map of your school grounds. Increase the size of it to A3 or project it to your interactive whiteboard. Discuss what it is and how it is (probably) a bird’s-eye view of the school. Discuss how maps can help us. Try to find your classroom, the toilets, the tuckshop, the oval etc on it. Which classroom is furthest away from the office? Which classroom is closest to the library? Ask students to describe to another student or the class how to get from your classroom to the tuckshop or how to get to their sibling’s classroom. What kinds of vocabulary do you need – left, right, straight ahead, turn at, go past etc. What other directions can students ask each other? Work in small groups or pairs. After the above discussions, on a whiteboard draw a bird’s-eye view of either the classroom or playground (maybe choose one that is the hardest). Ask students what objects need to be placed where and what it must contain (chairs, slide, desks etc). Discuss how you draw objects to ‘scale’ – you wouldn’t draw a chair bigger than a desk etc. Once students understand, ask them to draw one of either the playground or classroom. Or even their bedroom! After undertaking the above activities, look at some other maps. Try getting a map of a suburb, a city (maybe a street directory), rural Australia, and Australia. Compare the differences in the scales and discuss why the scales vary, why detail is needed in maps with denser population as opposed to rural. What is each map used for? Walking, driving, air travel etc. Look at the legends/symbols on the maps – what are they and how are they used? Can you find the cardinal directions – North, South, East and West? Do different colours on maps mean different things? Using the street directory, look up a street name (maybe where someone in the class lives). 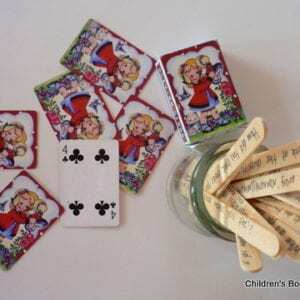 The directions will give you a number and a letter which will identify it on a certain page. Discover how this works. Did you notice in the book at the bottom of some pages there were illustrations depicting what things they need for school, what they eat at school, things they do with friends, things they learn at school etc. Choose a topic (with your class) that you could design a picture graph about. If you are asking ‘What things do you like to do with friends at school’ keep your categories under that heading probably under six, such as – playing on the slide, playing handball, reading, soccer, hopscotch, skipping, but ask the students to come up with the categories. Explain to them the graph can’t be too big! Then hand out squares of paper of equal size that the students can draw their favourite activity on from those categories. Draw up a big graph with x and y axis either on a large sheet of paper or a whiteboard. Show the children how to label each axis. Label your graph with at title too. Then have students glue on their favourite activity on the correct place. Discuss your graph and how it displays information for us to easily read.